We would like to welcome Stephen S. from Austin, TX, to the MyTennisLessons team. We pride ourselves on bringing on not only quality coaches, but quality people as well, which is why we are so excited to have Stephen on board. If you live in Austin, TX, review Stephen’s qualifications, teaching experience and hobbies below to see if they would be the right pro for you. Again, we are happy to expand our tennis lesson services in Austin, TX, with the addition of Stephen. Sign up with Stephen S. today! I am from Austin, TX, and played competitive tennis at the junior and collegiate level for more than 15 years. I was ranked nationally from age 10-18 and competed in both the Texas and Southern sections. I played Division I college tennis at Texas A&M University from 2005-2008. I was recently honorably discharged this February from the United States Army after serving six years in the 75th Ranger Regiment. 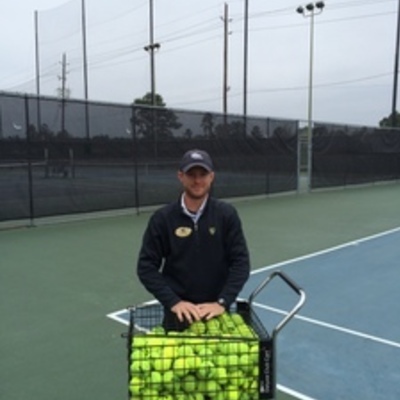 I was the head tennis professional at Walden on Lake Houston Golf and Country Club from February 2015-August 2015. I taught people of all ages and ability levels in private, semi-private, and group lesson structures up to 15 players at a time. I worked with children as young as 4 who were brand new to the game, and advanced super champs ranked highly in the state of Texas. I have in depth knowledge not only on the technical aspects of tennis, but also the physical requirements of the game. I recently moved back to Austin to further my education and spend more time with family. The primary reason that I like to teach tennis is for my students to get exercise, have fun, and improve as a tennis player. For beginners, I believe in a crawl, walk, run teaching philosophy in which certain fundamentals need to be mastered before progressing to more advanced areas of the game. I mix in hand feeding and basket feeding with live ball drills and structured point play. I encourage my students to practice outside of our lessons in order to ensure faster improvement. I love all types of running and I am currently training for my second marathon. I enjoy playing football, soccer, basketball and golf. I also am involved in a veteran non profit organization.